"I am building an art of, and for, a specific locality. 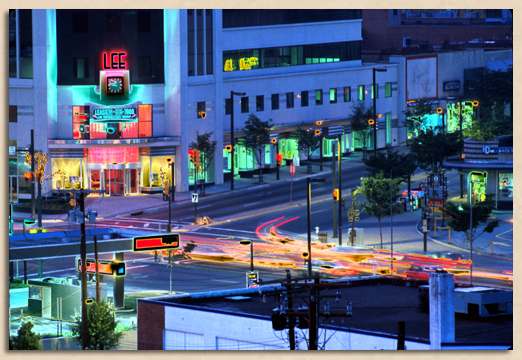 As a great admirer of Regional Art, with artist Grant Wood being my favorite proponent, I could never understand why Downtown Silver Spring rarely inspired artists to document its many memorable places and people. This page will serve as a virtual art gallery for just such works. If you would like to suggest a work of art, in any medium, that would be appropriate for inclusion in this gallery, please email Jerry A. McCoy at sshistory@yahoo.com. Copyrights for all works depicted are retained by individual artists. 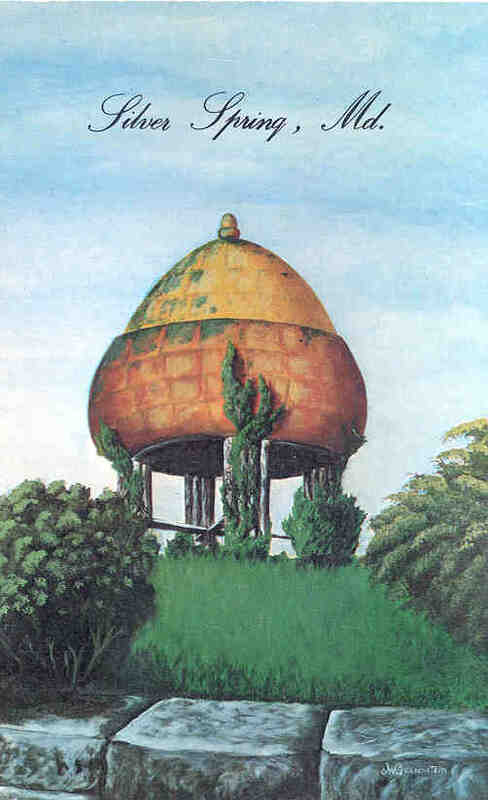 ABOVE: Oil painting as reproduced on postcard. Original dimensions of painting unknown. 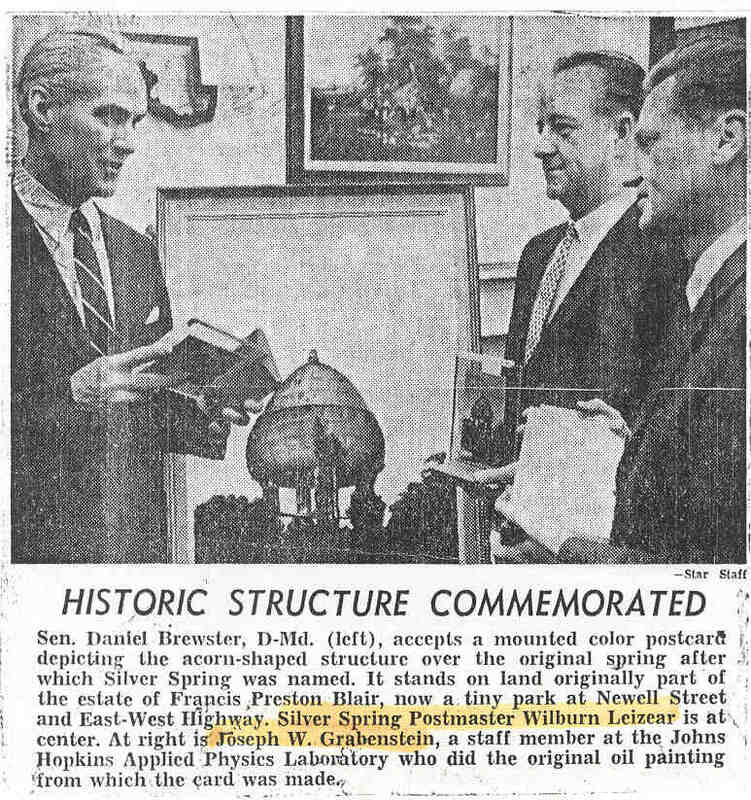 LEFT: Washington Post, Times Herald, December 18, 1967, p. B-4. Courtesy Washingtoniana Division, DC Plublic Library. 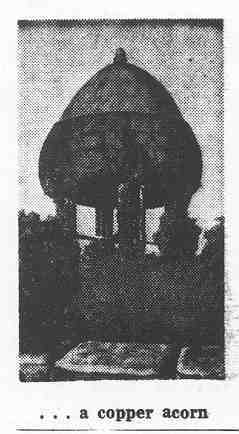 ABOVE: Undated article from untitled Johns Hopkins Applied Physics Laboratory publication. 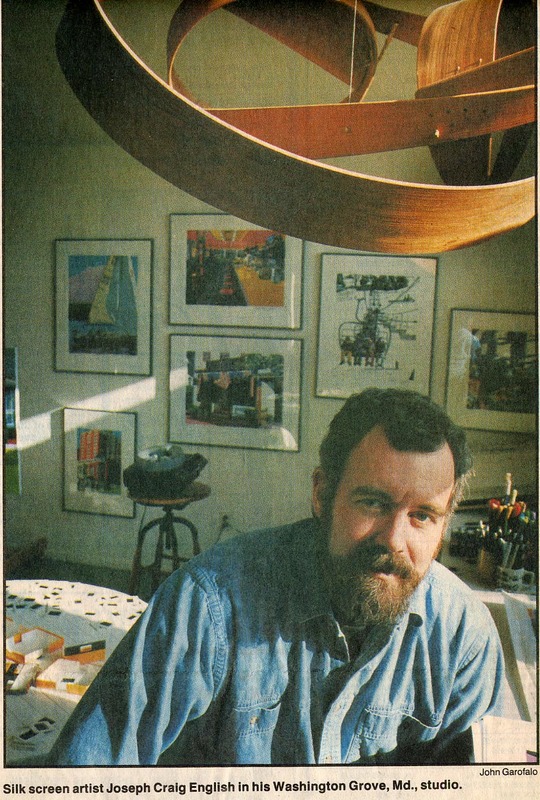 Collection of Jerry A. McCoy. 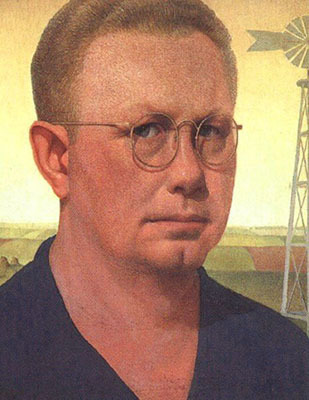 If anyone can supply biographical or contact information for Joseph W. Grabenstein, or know what became of this painting, please contact the SSHS at sshistory@yahoo.com. At the suggestion of Jerry A. McCoy ("Tip o' th' Pin to Jerry A. McCoy! 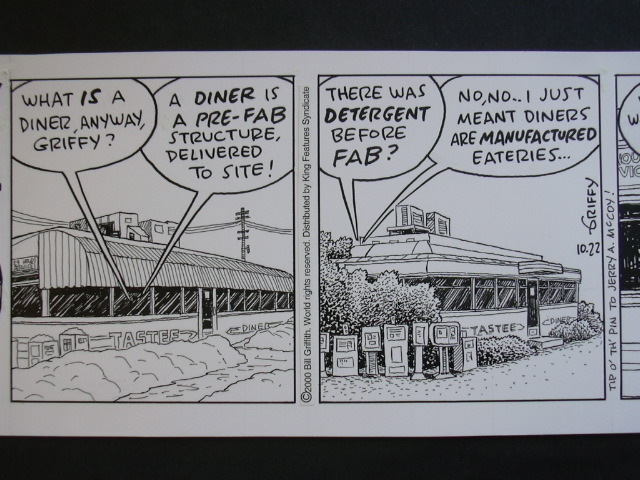 "), nationally syndicated cartoon artist Bill Griffith immortalized Tastee Diner's 2000 relocation. 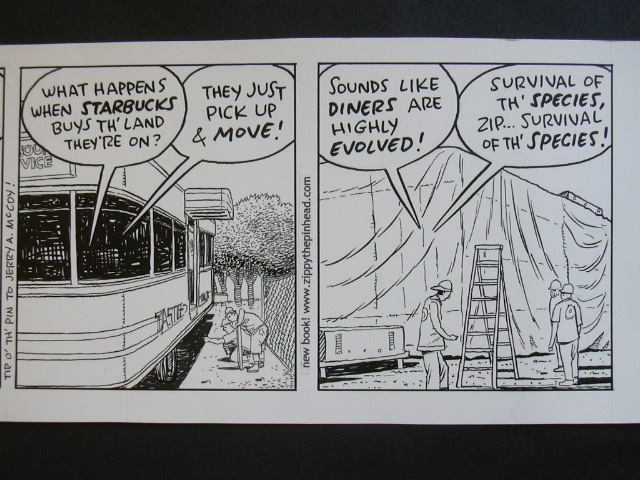 To read the October 26, 2000 Washington Post article about the strip, "Diner Moves into Sunday Comics" (and to see the colorized version of the strip as published), click HERE. BELOW: Original inked panels (5" x 18") from the collection of the Silver Spring Historical Society. 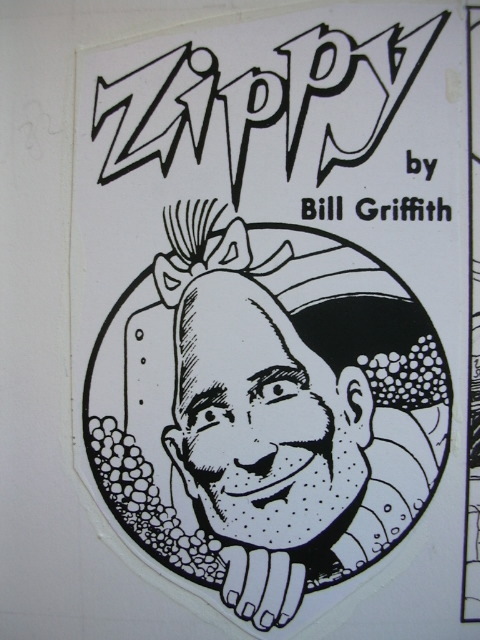 Silver Spring again appeared in "Zippy" when artist Raymond Kaskey's 12 ft. high bronze sculpture "Hand of Noah" appeared in the December 2, 2003 strip. The sculpture is located on East-West Highway a short distance from the Silver Spring Metro station in front of the National Oceanic and Atmospheric Administration. For inquiries as to the availability of purchasing this original art ($375), contact Bill Griffith at griffy@zippythepinhead.com. Signed prints in either B&W ($50) or color ($150) may be ordered HERE. Fred Folsom has always been drawn to people who live life on their own terms. Norman Lane (1911-1987) was just such a person. Known as "The Mayor of Silver Spring," Norman spent the good part of twenty-five years walking the streets and alleys of downtown Silver Spring. He collected handouts of money and food and did odd jobs around the community. His favorite beverage was Pabst Blue Ribbon beer...morning, noon and night. A construction hat was his headgear of choice and "Don't worry about it!" his repetitive mantra. Robert Phillips, owner of the Silver Spring Auto Body Shop (closed) provided Norman a cot and a hot plate in his business, the closest Norman would accept to the comforts of a home. When not "working," Norman rummaged through dumpsters, the ones behind Bell Florist and Pumphrey's Funeral Home (demolished) being his favorites. Why? Because he would pull out discarded roses and then proceed to give one to each lady he passed on the street. When the ABC television show "Real People" did a segment on Norman in 1979, it asked people on Georgia Avenue if they'd vote for Norman Lane if he actually ran for office, and everybody said sure, hell yes. One black guy said, "Why not? the last two white men I voted for were bums too." Such a colorful personality seemed to beg to be immortalized, and that was what Folsom did, creating dozens of studies, paintings and lithographs. 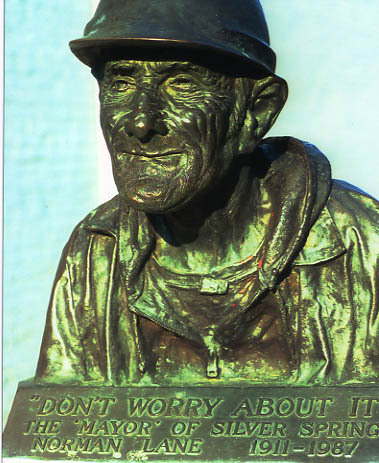 Four years after Norman passed away, in an abandoned automobile on Sligo Avenue, Folsom dedicated a bronze portrait bust in the walkway leading between Georgia Avenue and the front door of the former Silver Spring Auto Body Shop. 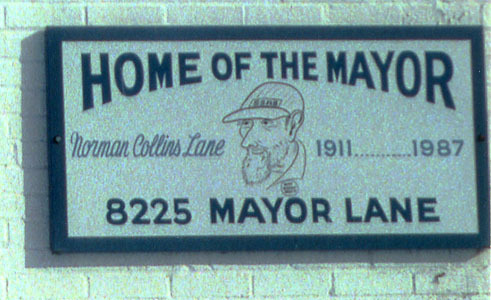 The alley that runs parallel to Georgia between Thayer and Sligo avenues was named "Mayor Lane." For more information on Fred Folsom, click HERE. ABOVE: Oil on masonite, 12" x 12". Collection of Jerry A. McCoy. BELOW: Invitation to "A Private Showing: The Mayor of Silver Spring (and other genre subject)." October 11-13, 1991. Collection of Jerry A. McCoy. ABOVE: For years this sign was attached to the Silver Spring Auto Body Shop until it disappeared in 2003 after the business shut down. Photo taken by Jerry A. McCoy in 1996. 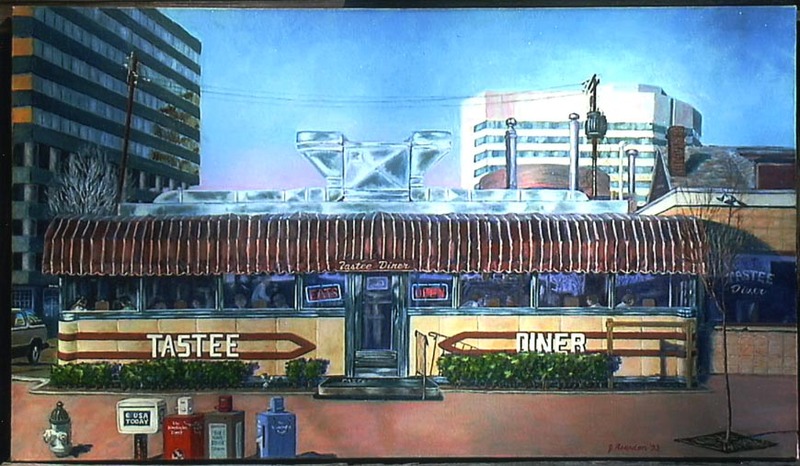 ABOVE: This 2' 4" x 5' 11" oil on canvas painting depicting Tastee Diner resides in the lobby of the Globe Building, 817 Silver Spring Avenue. 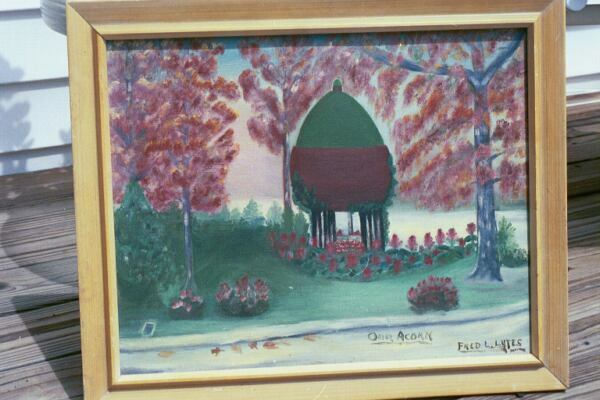 It was painted in 1991 by J. Holter. If anyone can supply biographical or contact information for J. Holter, please email sshistory@yahoo.com. Montgomery Journal, December 3, 1993. To be directed to Joseph Craig English's web site, click HERE. 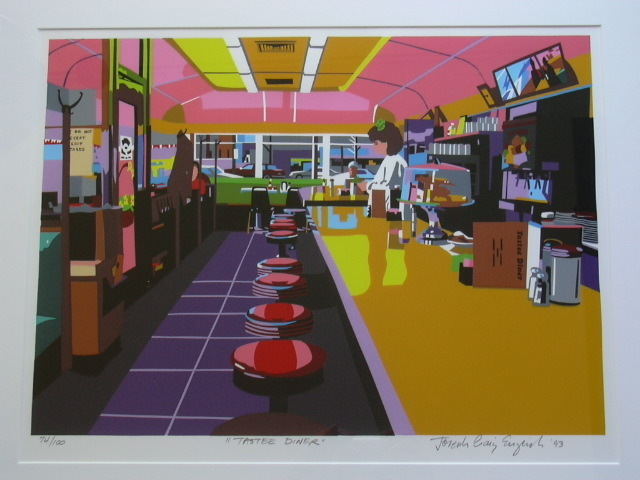 ABOVE: Tastee Diner by Joseph Craig English, 1993. Number 74 of an edition of 125. Size 16" x 22". Collection of Jerry and Nan McCoy. ABOVE: The Club L.T. No More by Connie Ward Woolard, acrylic on rag paper, 30 1/2" x 45". 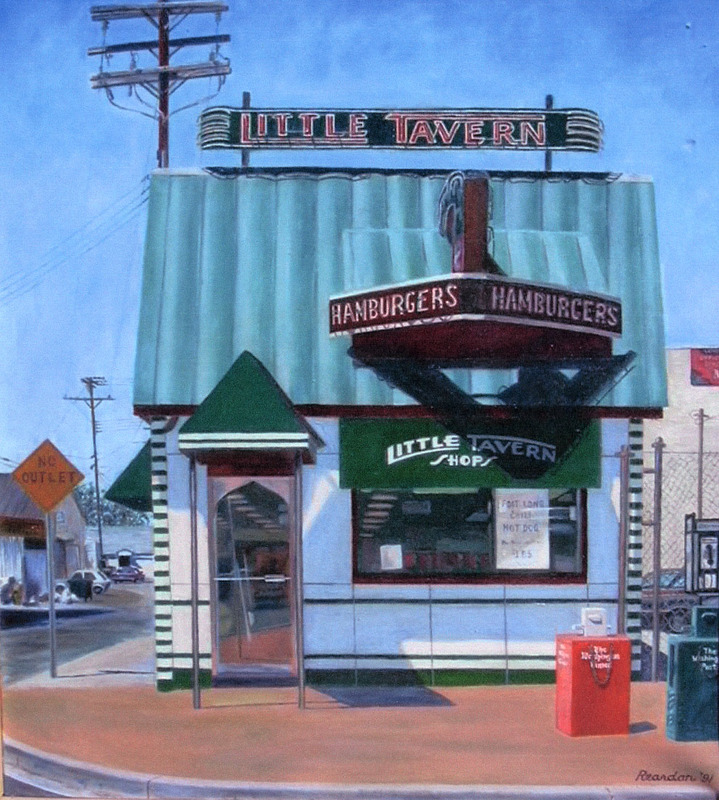 Prior to the senseless destruction of Silver Spring's Little Tavern, this "Club L.T." (located on Viers Mill Road in neighboring Wheaton) met a similar fate. Today an office building occupies the site. For purchase information on this artwork (Price - $650), contact the artist at (301) 946-4217. LEFT: Oil on canvas, 20 3/4" x 36". 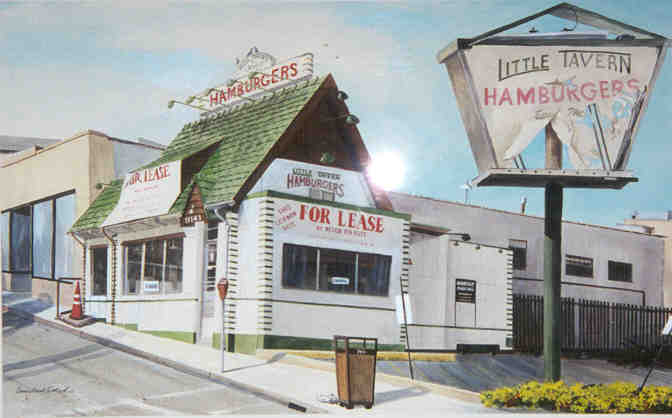 This is how Tastee Diner looked in 1981. 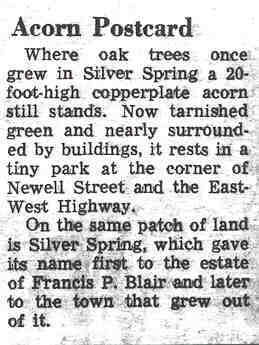 Collection of the Silver Spring Historical Society. BELOW: Oil on canvas, 20 1/5" x 36", dated 1993. 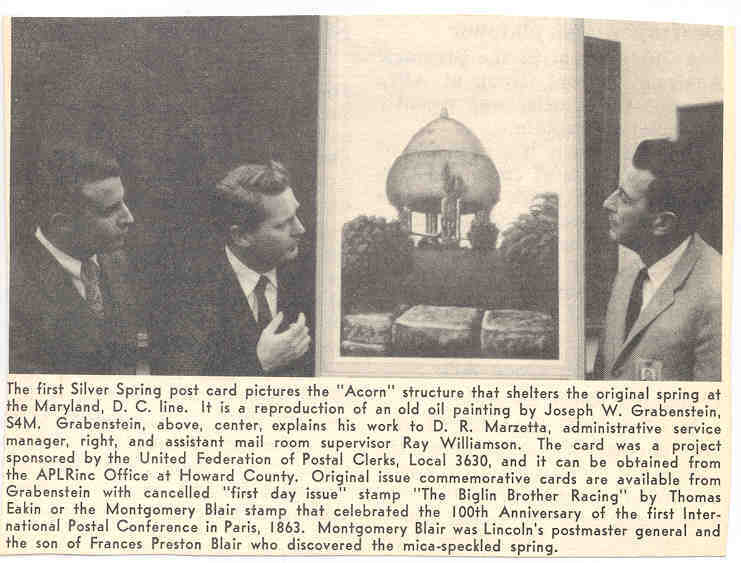 Collection of the Silver Spring Historical Society. BELOW: Oil on canvas, 23" x 26". This is how Little Tavern looked in 1991. Collection of Judy Reardon. RIGHT: Oil on canvas, 14" x 18". 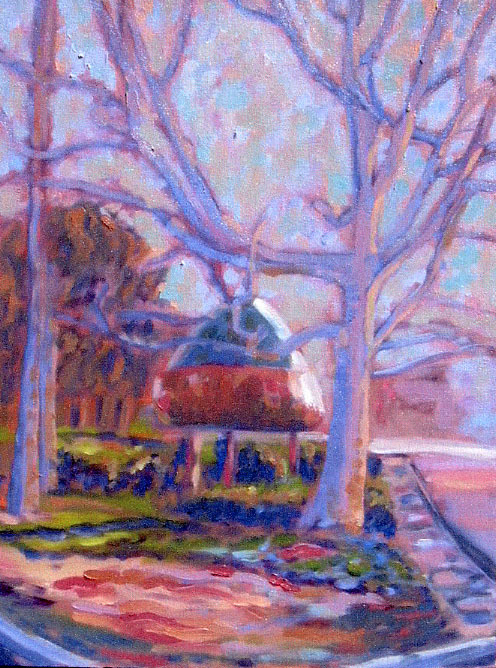 This circa 1850 acorn gazebo is located in Acorn Park, corner of Newell Street and East-West Highway. 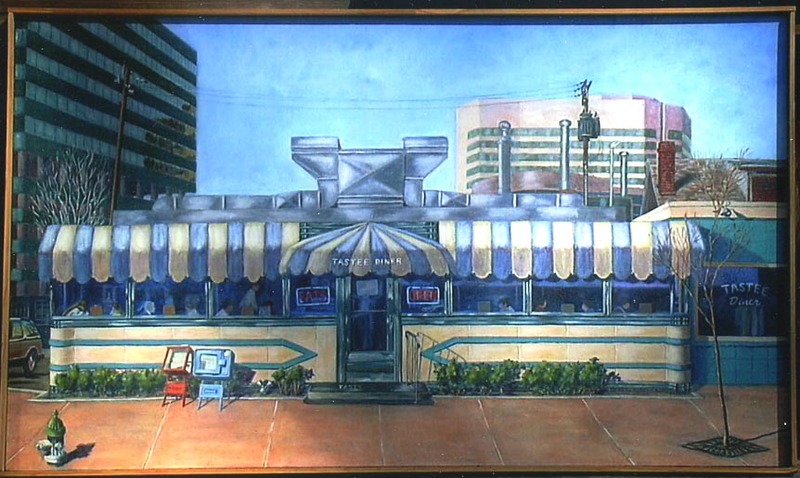 Painted in the early 1990s. Collection of Judy Reardon. 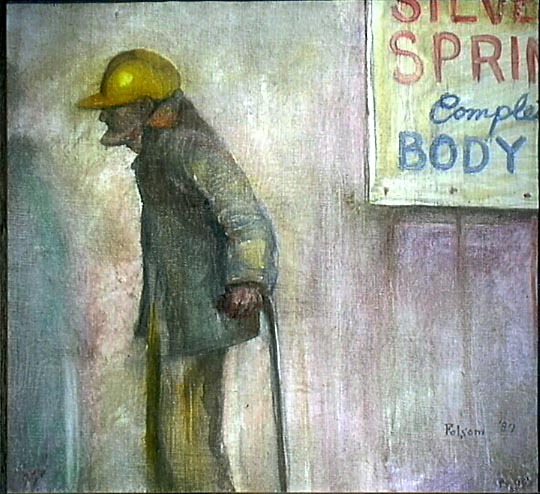 RIGHT: On the Verge of Change, 1995. 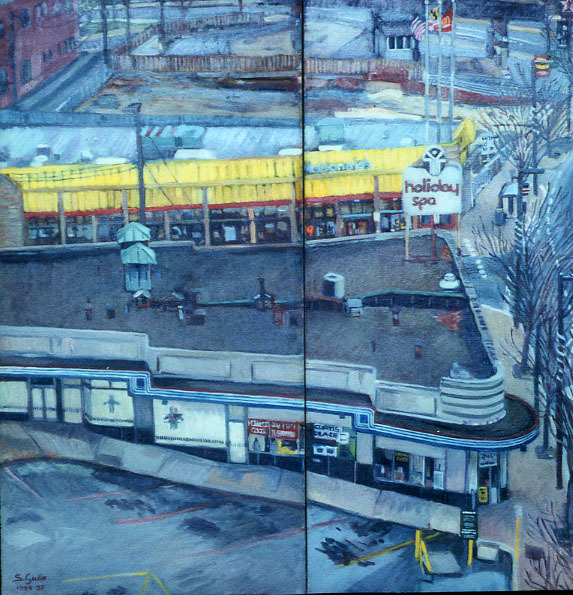 This 4' x 4' oil on canvas bird's eye view depicts the south end of the 1938 Silver Spring Shopping Center. Georgia Avenue is on the right. The McDonald's in the middle background and the Texaco gas station in the far background have since been demolished and replaced by the Nurse's Association Building. Sharon L. Gude may be reached at (301) 738-8767. TOP RIGHT: Portrait bust of Norman Lane by Fred Folsom, dedicated 1991. The statue is located on the east side of Georgia Avenue, mid-block between Thayer and Silver Spring Avenue. Photo by Jerry A. McCoy. 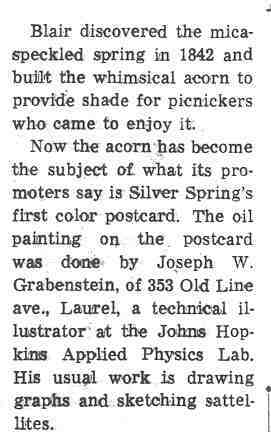 LEFT: Our Acorn is the work of self-taught artist Fred Lawrence Lutes (1889-1966), an important individual in the early history and growth of downtown Silver Spring. Silver Spring National Bank, the first bank in Silver Spring, established 1910. In 1945 he became the president of the bank, by then called Suburban National Bank. Lutes continued as president when the bank became Suburban Trust in 1951. He retired in 1966 and died later that same year. ABOVE: (Detail) Silver Spring: A Celebration of Life (2003) by Jorge Luis Somarriba pays homage to "our rich and multicultural community bonded by human kind's universal heritage of food plants from all over the world." The acrylic on Viroc mural measures 37' x 8' and is attached to the Whole Foods grocery store on Fenton Street at Wayne Avenue. 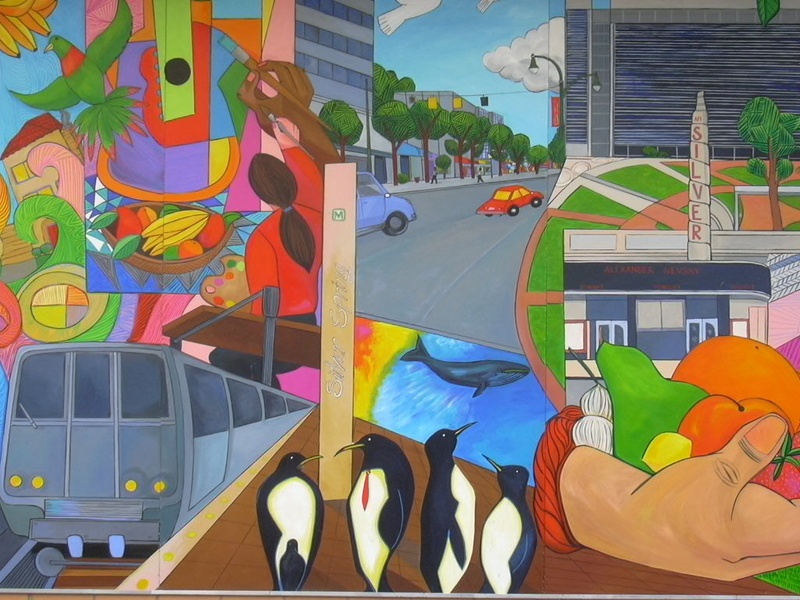 Local Silver Spring scenes included in the mural are the Discovery headquarters building, Colesville Road, Silver Theatre, Silver Spring Metro station, and a group of penguins from the station's mural, Penguin Rush Hour. 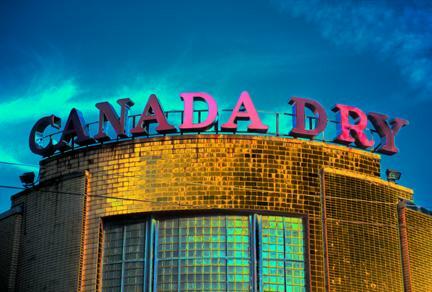 Photo by Jerry A. McCoy. Bob Coleman is a lifelong resident of Montgomery County, Maryland. He grew up in Silver Spring, and today lives in Montgomery Village. 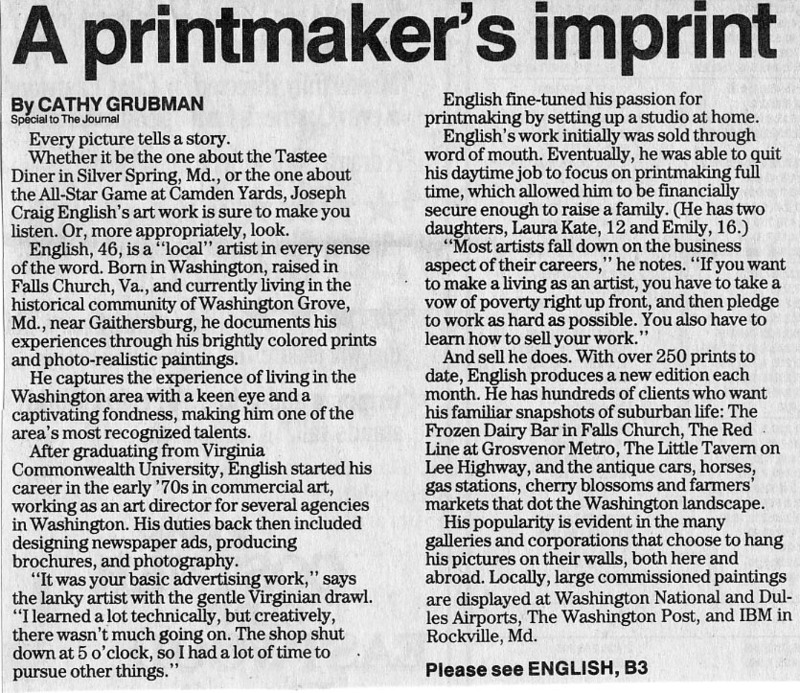 Bob specializes in art images that have been optimized and enhanced in Adobe Photoshop 6.0 on a Macintosh G4 computer, and then proofed and printed on a Epson 1270 inkjet printer. Some are then futher modified with filters, plug-ins, etc. The driving force behind Bob's modified photographs is to simply heighten what appealed to him when he first snapped the photograph, and to not get too far away from the original picture.